VTT fabricates lightweight, easy to use RF, EMI, & RFID Shielding Curtains out of the Shieldex® line of conductive fabrics. These RF blocking curtains are relocatable shields designed for test station isolation, cross talk reduction, RFID isolation, and ambient reduction. 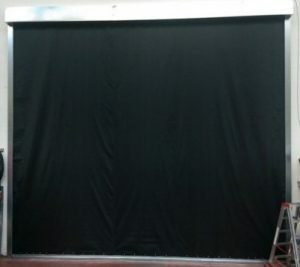 VTT’s RF blocking curtains are constructed using high quality shielded material provided by Statex. The curtains are available in multiple sizes, layers, and hanging configurations. VTT’s RFID curtains are most commonly used in warehouse applications for the attenuation of RFID signals. The RFID curtain can put a stop to faulty frequency scanning and lead to better, more accurate data management in your warehouse. 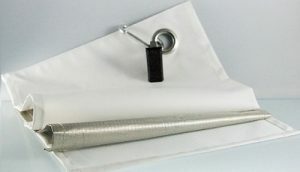 The V Technical Textiles brand of RF & EMI shielding curtains are perfect for isolating test stations at the end of production lines, isolating test cells from adjacent test cells, reducing cross talk, isolating RFID sensors and transmitters on assembly or packaging lines, as an alternative for architectural shielding installations, and any application requiring an ambient reduced environment. Their light weight, and ease of assembly make them very user friendly. VTT RF blocking curtains can be configured to suit your specific shielding requirements in a wide range of available configurations.